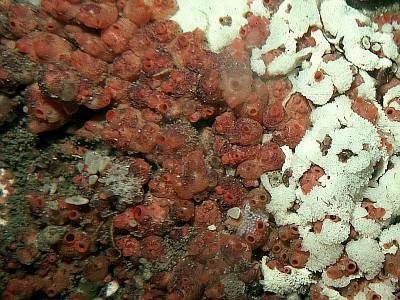 Description: This solitary sea squirt often occurs in dense aggregations. Individuals are rounded in shape and bright red or orange red in colour. The two siphons project from the upper side of the body and are round in cross-section. In silty conditions the test is often discoloured and becomes brown or blackened. Habitat: Found in a wide range of habitats, from very exposed shallow surge gullies to shells and stones in sheltered conditions. Similar Species: This species is similar in external appearance to Distomus variolosus, Stolonica socialis and Polycarpa scuba. Styela coriacea is like a solitary Dendrodoa which has an apron around the base and grows on shells. It can be common in the north of Britain. Internal anatomy, with single basal gonad. Picton, B.E. & Morrow, C.C. (2016). Dendrodoa grossularia (van Beneden, 1846). [In] Encyclopedia of Marine Life of Britain and Ireland.